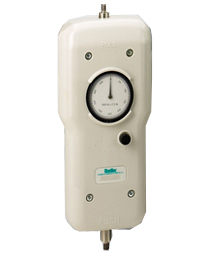 The CHATILLON® LG Series mechanical force gauge is ideal for a wide range of force testing applications. Based on our popular DPP Series force gauge, the LG Series features a larger, 2.25-inch dial for improved resolution and readability, peak hold button, ergonomic shape and improved accuracy of +0.5% of full scale. The LG gauge is an excellent, economical solution for tensile or compression testing. The durable, plastic housing fits naturally in the hand for a comfortable and firm grip even at maximum loads. Gauges may be mounted to a test stand for even greater control and consistent results in repetitive testing applications. The easy to read concentric dial measures clockwise only. Dial rotates 360-degrees for taring. A peak hold button captures peak readings and can be easily and quickly returned to zero. A mechanical overload feature protects the gauge from damage. Available in lbf, kgf or N units of measure.